The United States will be limited to several hundred electric Smart cars in 2010, the first year of production. San Francisco and Austin, Texas, are under consideration to get the first ones. Availability will expand in 2012. DETROIT — Smart's electric-powered ForTwo will be limited to several hundred vehicles for its U.S. launch in 2010. The car will be available in just a few U.S. cities, said Anders-Sundt Jensen, vice president for Smart brand communications. "We will launch it first in Berlin; then in Paris, Rome; and we will continue to expand to other European cities," Jensen said. Among the cities under consideration for the first U.S. sales are San Francisco and Austin, Texas. 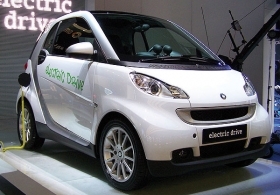 In 2012, the electric Smart will be offered in more cities. Jensen said the electric Smart likely will be offered only with leases. Although it is too early to estimate the monthly lease payment, the car will have a premium price. "The technology is quite expensive. Because the technology is an untraditional powertrain, you have a special customer requesting it," Jensen said at the Detroit auto show. "You have the guy who wants to be first in the market. You have customers who want to demonstrate by philosophy and their way of living that they are making a difference. Finally, you have people who say this fits the image of my company, and emotionally they are willing to pay a higher price." The electric-powered ForTwo will go into production at the end of the year. Power will be supplied by lithium ion batteries that have a range of 62 to 68 miles. He said the electric-powered ForTwo eventually could account for 20 to 50 percent of Smart's global production. Sales will depend on whether governments provide tax incentives and whether a region develops widely available recharging stations.